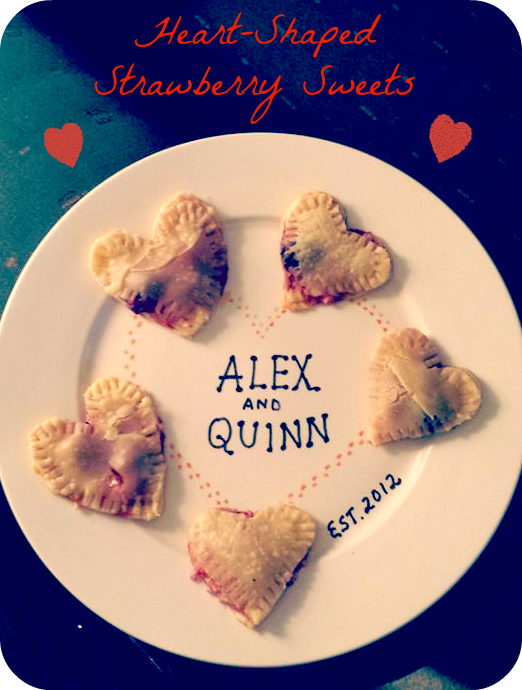 Quinntessential Home | Recipes, Crafts, Apartment Living: Valentine's Day Sweets for my Sweet! This was a completely concocted recipe based on the ingredients I had on hand, so please bear with me! Some of the ingredients may seem strange (cottage cheese? ), but I swear the final product tastes amazing! Preheat oven to 375 degrees. Line baking sheet with either parchment paper or aluminum foil, whichever you have on hand. Cut out heart shapes with cookie cutter (or freehand it with a knife like I did!). Be sure to cut out an even number of hearts or you'll have a leftover heart (like I did). Lay out heart cutouts on baking sheet. Spoon on some cottage cheese and chopped, fresh fruit. Lay down the top dough, then seal to press with a fork. Brush the top of the hearts with melted butter and bake for about 15 minutes, or until the hearts are golden brown. Baking time can vary by oven and thickness of your pie dough, so keep an eye on the hearts because nobody wants a burnt heart pastry! Cool for 5 minutes before moving to a wire rack or plate. Dust with powdered sugar (if desired) and serve. Now go show your lover how much you care about them by making them a heart-shaped sweet - I guarantee you'll get a thank you smooch for your effort!